When I became a Christian, the first thing I learned was personalizing the Psalms. At the time, I did not know that praying the Psalms was something Christians had been doing for centuries. In fact, originally the Psalms were used as a Temple Hymnbook and accompanied by music. The Psalms actually span over a thousand years of history and written by over seven authors, David being the most well known. Over the years, I have found a wonderful world in the Psalms. In good times and in bad, they have given me great confidence in this loving God we serve. As outlined here below, you can see that the various Psalms address our entire human experience. Definitely the Psalms have the power to bring us closer to God, and I believe they are already apart of ‘who’ we are. They are filled with celebration, praise and worship. They give us joy, reassurance, contentment and trust. I believe that God wants us to know Him. The Psalms gives us that opportunity to better understand His ways, and His tremendous love for us. A love so great that He sent His only son to lead us back to Himself. "Praise the Lord, O My Soul!" Psalm 5 Will help us to learn how to come to God and to know His desire to bless us. Psalm 8 Taking a closer look, this Psalm will help us to understand ourselves better. Psalm 15 This Psalm outlines how to live a Life that will be pleasing to our God. Psalm 23 This Psalm will give us comfort and reassurance that God will take care of all the details in our life. Psalm 24 This will help us to understand that everything belongs to God. Psalm 51 This will help us when we need God's mercy and forgiveness. Psalm 91 This Psalm will provide us with protection when we are in need of it. Psalm 92 This will help us to be thankful and faithful everyday. Psalm 103 This will help us to understand God's tremendous love for us and what He is like. Psalm 104 We can learn why we should worship God as we understand that His care is the source of our gladness. Psalm 119 This will help us to understand that we are to stay true to God's' word no matter what happens in the world. Psalm 136 Because God's love never fails, this will help us know why we are to give thanks to God. Psalm 139 This will help us understand that God has His hand on us and that it is a gift from God that He allows us to come to know him. 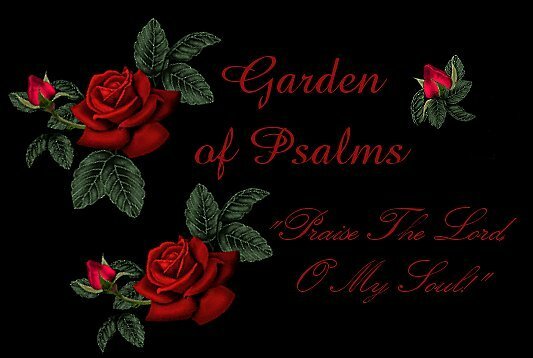 Psalm 145 This will give us evidence why we are to give praise to God and that He will satisfy us when we trust in Him. Psalm 146 This will give us assurance that God is in control. You can search the Psalms using the translation of your choice with "The Bible Gateway"
Jesus is the only way back to our Heavenly Father. If you're not sure of your standing with Him, you may want to click the link below for your own peace of mind. Compliments of Songs Of Praise used with permission.